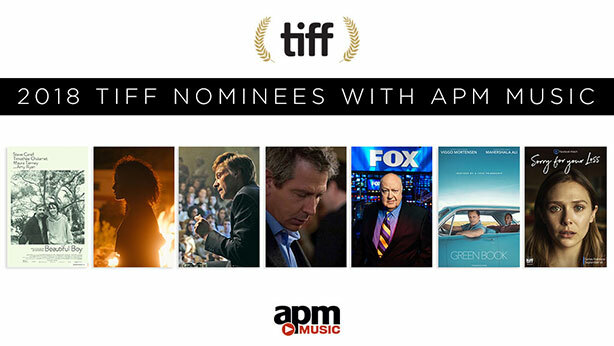 APM Music is proud to be a source of music for the following films showing at this year’s TIFF (Toronto International Film Festival). Beautiful Boy - Featuring the APM Track: "Pretty Singer"
Divide and Conquer: The Story of Roger Ailes - Featuring the APM Tracks: "Moonlight Sonata 1st Mvt" & "Funeral March Of A Marionette"
The Front Runner: - Featuring the APM Track: "Son La China"
Green Book - Featuring the APM Tracks: "After You've Gone," "Troubled Romance," "O Christmas Tree" & "What Child is This?" The Land of Steady Habits - Featuring the APM Track: "The Holly And The Ivy"
Sorry for your Loss (Facebook Watch Series) - Featuring the APM Tracks: "Too Late For Tears," "Right here Right Now," "Tropical Green," "Drummer Boy," Miss Incredible," "Live this Moment," "The Way U Love Me," "You and Me," "How We Do This," "Sun Flares," "Sacha N' Aime Pas Le Cha Cha," "Simple Samba" & "Teen Scene"